As of January 2018, CWI researcher Lynda Hardman is the new chair of the management team of Amsterdam Data Science. Peter Boncz, CWI researcher and part of the CWI management team, will join the ADS Supervisory Board. 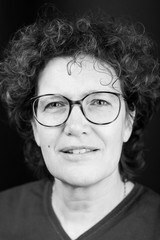 Lynda Hardman is a senior researcher in the Information Access research group at CWI, and Professor of Multimedia Discourse Interaction at Utrecht University. Previously Hardman was President of the Board of Informatics Europe. For more information, please visit her personal webpage. Peter Boncz is part of CWI’s Database Architectures research group, and professor of Large-Scale Analytical Data Management at the Vrije Universiteit Amsterdam. He joined the CWI management team as of January 2018. For more information, please visit his personal webpage. Nanda Piersma is a Professor (lector) by Special Appointment in ‘Urban Analytics’ at the Amsterdam University of Applied Sciences (AUAS). Her research group strengthens the collaboration between AUAS and CWI, where Piersma works part-time (50%). For more information, please visit her personal webpage.